Lymphocyte and phagocyte are two types of cells that mediate immune responses in the body. The immune response is the method by which the body recognizes foreign and harmful materials. The three types of lymphocytes are T cells, B cells, and natural killer cells. The T cells destroy pathogens in a specific manner and activate B cells to produce antigen-specific antibodies. Phagocytes can be either macrophages, neutrophils, monocytes, dendritic cells or mast cells. They destroy pathogens by phagocytosis. 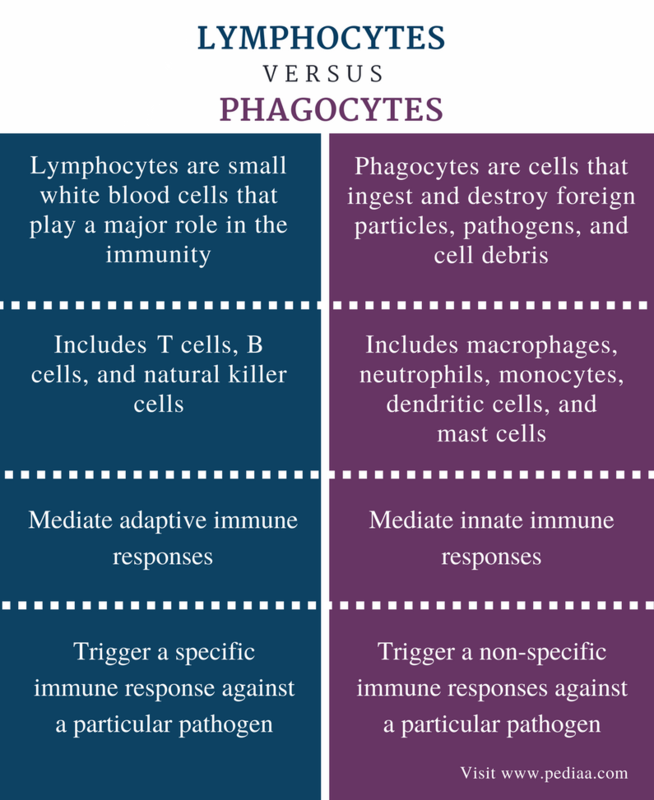 The main difference between lymphocytes and phagocytes is that lymphocytes generate specific immune responses against pathogens whereas phagocytes generate the same response to any pathogen. This means lymphocytes are the tools of the adaptive immunity whereas phagocytes are the tools of innate immunity. Lymphocytes are small white blood cells that are involved in the immunity of the body. They defend the body against pathogens, foreign matter, and tumor cells. The lymphocytes mainly circulate in the blood and lymphatic system. They are also found in the bone marrow, spleen, thymus, liver, lymph nodes, and tonsils. Lymphocytes generate a specific immune response against each type of pathogens inside the body. This specific immune response is referred to as adaptive immunity. The two types of adaptive immunity are humoral or antigen-mediated immunity (AMI) and the cell-mediated immunity (CMI). The AMI is mediated by the T cells, which develop in the bone marrow and thymus. 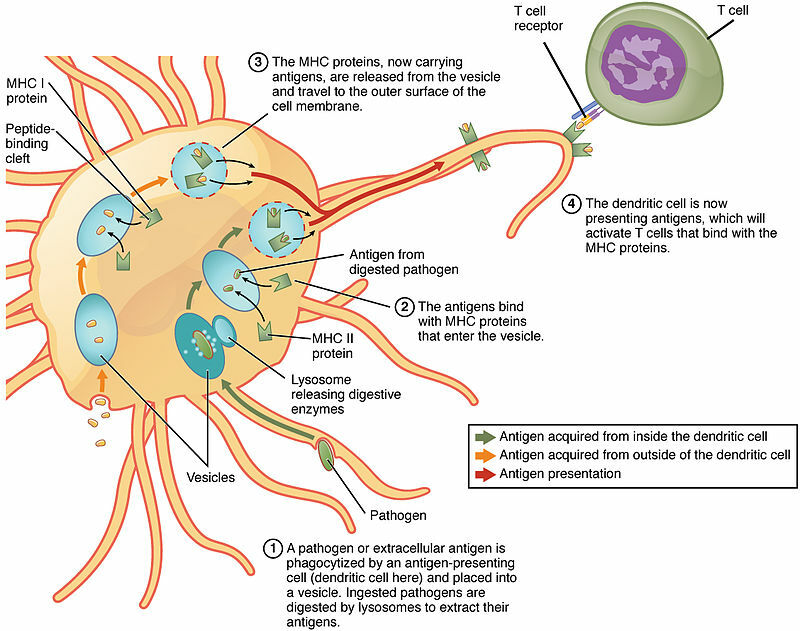 The various types of antigens are specifically recognized by the various T cell receptors (TCR) on the T cell membrane. The three types of T cells are the helper T (TH) cells, cytotoxic T (TC) cells, and suppressor T cells. The TH cells stimulate the production of antibodies by the B cells. The TC cells induce the apoptosis of the infected cells. The suppressor T cells inhibit the immune response towards the self-antigens in the body. The AMI is mediated by the B cells, which develop in the bone marrow. The B cells trigger immune responses against bacteria and viruses in the circulation. The plasma B cells produce specific-antibodies against the various pathogens that invade the body. Some activated B cells which have previously encountered a particular pathogen are stored in the spleen and thymus as memory B cells. The third type of lymphocytes is the natural killer cells. 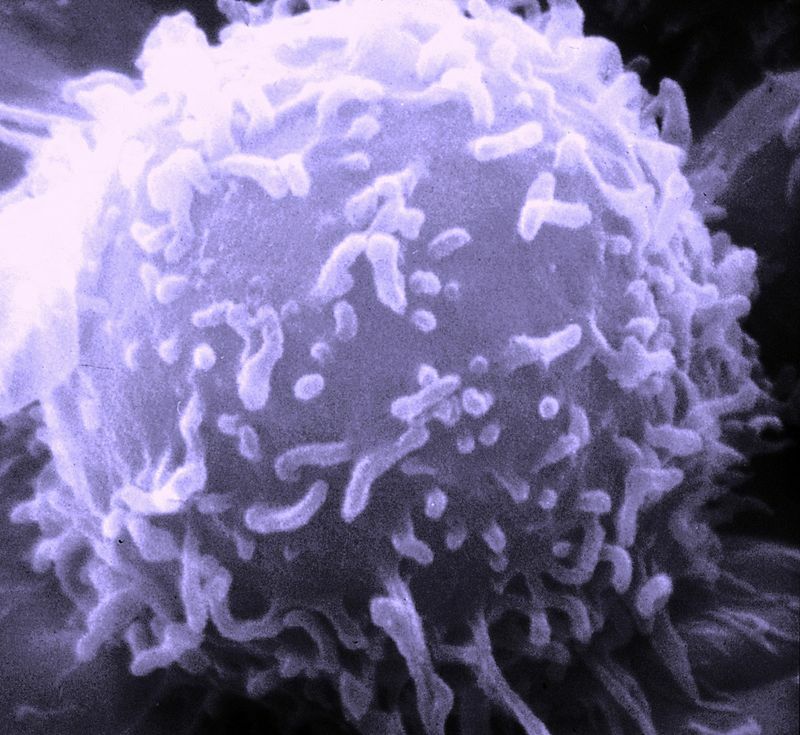 The natural killer cells are capable of identifying tumor cells in the body. These cells are also capable of inducing apoptosis of the infected cells. A lymphocyte is shown in figure 1. Phagocytes are the cells that ingest and destroy foreign particles, pathogens, and cell debris. They are a major component of innate immunity in which a non-specific immune response is generated against pathogens. The ingestion of the foreign particles by phagocytes is called phagocytosis. Macrophages, neutrophils, monocytes, dendritic cells, and mast cells are types of phagocytes. Monocytes are large white blood cells in the circulation, which differentiate into macrophages. Macrophages have a long life cells; although they are slow to trigger, their immune response immune responses against pathogens lasts longer. They engulf pathogens, dead cells, and cell debris, digest them inside a vacuole and release the waste by exocytosis. This process is called phagocytosis. The dendritic cells also phagocytize the pathogens, and they are also the major type of antigen presenting cells in the immune system. Both macrophages and dendritic cells are considered as professional phagocytes. Neutrophils are the most abundant granulocytes in the blood, and they are the first immune cells that migrate to the site of infection. The migration is called chemotaxis. Neutrophils produce acute inflammation. The mast cells secrete various chemical mediators, which trigger allergic responses. The antigen processing and presentation by the dendritic cells is shown in figure 2. Both lymphocytes and phagocytes are parts of the immune system. Most lymphocytes and phagocytes are found in the blood. Both lymphocytes and phagocytes destroy foreign materials inside the body. Lymphocytes: Lymphocytes are small white blood cells that play a major role in the immunity. Phagocytes: Phagocytes are cells that ingest and destroy foreign particles, pathogens, and cell debris. Lymphocytes: T cells, B cells, and the natural killer cells are the three types of lymphocytes. Phagocytes: Macrophages, neutrophils, monocytes, dendritic cells, and mast cells are the types of phagocytes. Lymphocytes: Lymphocytes mediate adaptive immune responses. Phagocytes: Phagocytes mediate innate immune responses. Lymphocytes: Lymphocytes trigger a specific immune response against a particular pathogen. Phagocytes: Phagocytes trigger non-specific immune responses against a particular pathogen. Lymphocytes and phagocytes are two types of cells in the immune system. The T cells, B cells, and natural killer cells are the three types of lymphocytes. Macrophages, neutrophils, monocytes, dendritic cells, and mast cells are the types of phagocytes. Lymphocytes generate a specific immune response for each type of pathogens. In contrast, phagocytes destroy any type of pathogens by engulfing them. The main difference between lymphocytes and phagocytes is the type of immune response triggered by them. 1.Bailey, Regina. “Lymphocytes: Defenders of the Body.” ThoughtCo, Available here. Accessed 19 Sept. 2017. 2.“The Human Immune system.” The Crohnie, Available here. Accessed 19 Sept. 2017.